Two Player!This has been a rough day for me! I finally got my space duel game working with two players. That is, it worked fine in the EDITOR. However, when I made a build of it, the fire buttons wouldn't work! I spent hours looking into the input functions to no avail. Finally, I discovered the problem had something to do with the update speed of the editor vs. the build. I'm still not exactly sure what the problem was, but it had something to do with the way I instantiated and positioned the bullets. I figured I'd check to see which fire button was pressed, then check to see where the corresponding ship was located. The big complication here is that I need to impart an initial velocity (set by each player) to their bullets. But how to get the right variable to the bullet? I'll spare you the details, which I don't really understand, but the short of it I managed to kludge through it. At any rate, I think there's enough here for you to finally see my vision for the gameplay. You've got a two-player dog fight, ships orbiting the planets. Each time you fire, there's a cooldown period before you can fire again. You have to hit the enemy ship head-on to blow it up, and, yes, you can blow yourself up if you're not careful. 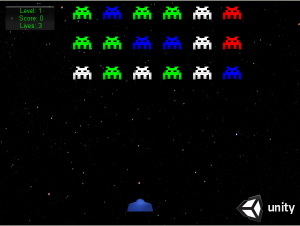 Match 3 InvadersI'm back again with an updated version of Match 3 Invaders. This time I added background music (not my own composition, but rather one by a composer named "Data" that was included in the Audiodraft Music pack 1 (free in assets store). It's a really fun, chiptune that seems to fit the mood perfectly. Indeed, it's amazing to me how much more fun the game becomes with the track playing. I also added a little text pop up to let you know when you score a chain bonus (anything beyond a match 3). That adds some fun, too, since you can't help but try to get the biggest chain possible. While I was fooling around the assets store, I also downloaded a shaders pack. The results aren't as good as I was hoping given the samples, but I still they think they make the game look more polished. I'm feeling pretty good about this release; it really feels like the pieces are finally coming together. Pretty much all placeholders here for graphics and such, but I think the gameplay is pretty clear at this point. I've added increasingly difficult levels, a simple power-up to boost your ammo, lives, and of course a high score table. The high score table gave me a lot of trouble; I probably should have just got the one for $25, but free was hard to pass up. I had to modify it extensively to get it to work, and I'm still not very comfortable with it; but it SEEMS to work. Try it out and let me know what you think!